This smoke alarm is compliant with New Zealand Building codes for use in rentals or owner's own resendintial homes. So can be used as a primary smoke alarm, certified to EN14604:2005/AC2008 standard for aproval in New Zealand. Detecting smoke, sensoring danger in advance and reducing risk of fire. 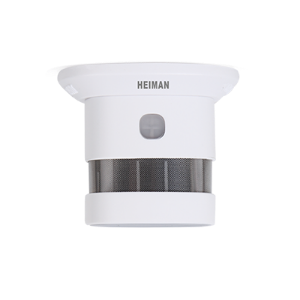 Real-time monitoring of the presence of smoke detection, once the smoke fire hazard is detected, the red led of alarm immediately flashes quickly, and sounds alarm. Sensitive to detect small amounts of smoke. is one of the top internationally recognized industrial design awards in the world, with the German iF Award and the IDEA Award from the United States, and is named as the world's three major design awards. At first, it was a pure German award but gradually grew into an international Well-known Creative Design Awards, each year, some of the outstanding works of art to achieve the highest quality of design will be awarded the "Red Dot Award", this award and has been named "International Academy of Industrial Design," said.